This week's TOTW players include a special LTD Bobby Wagner. Wagner will be in packs for just 48 hours. What do you think of this week's Team of the Week selection? Cohen needs an upgrade he's like the best recieveing back in the league plus he's 5'6 he is a good insperation. I'm a dallas fan and I can't even necessarily agree with the selection. But i won't complain. Hopefully Xavien Howard will get a high overall Zero Chill card, and a powerup card next series update, the man is a beastly coverage corner! 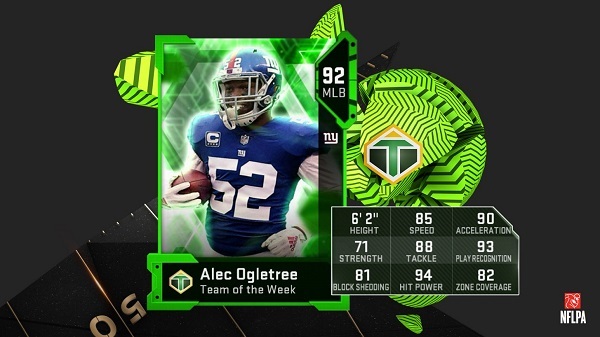 I don't understand why EA is still releasing TOTW players, especially the heroes, without giving them a powerup. They did it on the fly with Jared Goff, so why they can't do it for Ogletree this week, or Judon last week, is crazy. Would have been a great opportunity to have both Seahawks, with WIlson being the boss... 4 tds and the way he got them? Cmon. Xfl will be putting out a football game in 2020. I'll be sure to play that. 2k knows how to make a game unlike this garbage. If you think Madden is monetized you haven't played any of the NBA 2k games.. You think Madden is pay to win? 2k has monetized every single aspect of both their multiplayer modes. It is the most pay to win garbage, ever. So, you have fun playing a videogame, based on the XFL, which already failed once... while paying money on their version of VC to customize your hairstyle. Were you expecting a TOWT card for him after his 6-49 line? So ya'll just gonna give the Vikings a card when they lost and not give the 49rs a card for 3 weeks? Wow Tarik Cohen just got trashed big time. Great job EA. He is having a good year, yet his best card is an 87! Why do they keep trying my dawg Xavien?